It is the wearing o'the green on Monday. 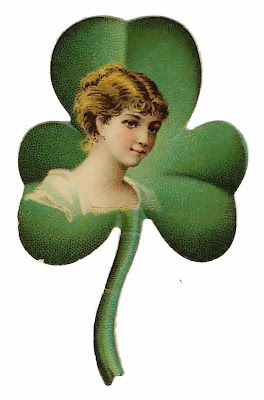 May lots o'luck come your way. You still have time to make a bit o'green to wear for that day. You can make a shamrock green brooch or a shamrock shaped pin out of Penny's hearts; just don't forget to shrink her pattern down or it will be huge. Or have lots of fun and combine the two ideas and make something new. If food is on your mind, you could even make old fashioned rock candy in the color of green. Cream cheese mints could even be nice with green food coloring and mint flavors for the holiday. I always make corned beef (of course) and green mashed potatoes. My kids love it! Have a wonderful St Patty's day.